Home About the Crew Cruise Log Articles Alice's Book S.o.S.? Months and years have passed since anything new was entered here. Life has changed for us. 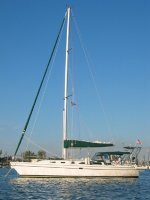 We are no longer living aboard Caloosa Spirit. In fact, Caloosa Spirit no longer exists—in the form that we knew her, anyway. We sold our Catalina 42 in 2013, and she now lives on Lake Erie under another name. Even with a change of name and scene, we believe that Caloosa Spirit is happy to be cruising again. While we miss the live-aboard lifestyle, we have settled into land living in Indianapolis once again. I continue to live with my lung condition, and I now must visit my doctor’s office every two weeks to get three injections. Without getting too bio-technical, suffice to say that the medication works to maintain my immune system, and I have had no further incidents of lung problems. An added bonus is that allergic reactions to the myriad allergens that my immune system attempts to fight off have decreased significantly. I can now spend time around cats (several days, anyway) and garden with impunity. Life is good for us. We never did get into RV-ing—a possibility mentioned in the previous log. We kept putting off that purchase until the boat sold, and by then I was on a short leash with my injections. We’re still working on how to find the next adventure over the horizon. This website will remain available for any who wish to view it, but further updates are not anticipated at this time. We hope that our cruising adventures will continue to inspire other would-be cruisers. It most certainly is a lifestyle worth living for as long as one has the ability and the desire. So for anyone out there who is called to the sea as we were, keep the faith and follow your dream! Click here to share your comments! Hosted by Aosoft Internet Services, Inc.